"Baja California Sur" separates the Mexican south coast of the Gulf of California from the Pacific Ocean. La Paz, the capital "La Villa" of this charming landscape offers a colorful mix of culture and wild west. With a slightly poor outfit this city with an estimated population of 20.000 inhabitants reveals a cultural past, which has been constantly changing for almost 500 years. Who promenaded in Havana / Cuba on the "bordwalk" of the Caribbean, the Malecon, will discover in La Paz the 2,5 km long beach promenade of the same name with an equally nice flair, and for us divers with even more substance and originality. The metal plastic works along the shore of the Pacific seem a little smaller and worn, however, they represent the pride of the town in a natural beauty and reflect to locals and tourists the speciality and creativity of the performing artist. Starting from the founder of the city Herman Cortés, to Jacques Yves Cousteau and up to the typical sea inhabitants, the whales, sea lions and dolphins, art has typed the way of the Malecon and has made it unique. Up until today the architecture has chosen no architectural style, it shows more of the feelings of the builders - a little Wild West and even Mexican composure - than the will of the Alcalden / mayor to beautiful segmented boroughs. That is what I liked particularly, it was a little bit cozy, a little bit mysterious and a little bit adventurous. When a Mexican with a Sombrero pushed in his face slept leaning against a crumbled house wall, it was for me the postcard stereotype, for the locals the normal siesta. One must see La Paz and recognize the people, because Mexicans are different, they are no Spaniards and also no Americans, everything distinguishes them from the stereotype, however, one can describe them, they always remain the charming Amigos, whether in threads or poncho. Charmingly also because they love senseless superlatives, as for example their means of transportation. They meet our sustainability and environment protection thoughts with lack of understanding, if one criticizes their caddies, because the tires actually belong to an overland truck, or because the VW BEETLEs should actually have fenders and engine bonnets. But the sound is potent - "suena como un toro" - they grin, because that is of importance. So this is where we want to organize our 16th CMAS World Championships? We will see, it will be different here, we will have to integrate ourselves, see it easier, then it will be a great experience. Under the water surface "everything goes like a train". At this time of season calm, clear water. Small boats (max. 10 people) will take the divers to the diving areas with international fame. Our diving-tops are nearby or directly at the cliffs of "Isla Espiritu Santo Balandra". Whale shark warranty? Sea lions? - For sure. Or close-up motives? Everything at hand. Wrecks - large shoals of fish - corals soft and hard? Okay - Manjana / Tomorrow - Today we still want to go to the Faro San Rafaelito / the lighthouse. Here it all starts over again - alongside the boat two sea lions are dozing in the sun at the surface. Address: Pichilingue Km 7.5, Marina Costa Baja, 23019 La Paz, B.C.S. Based in La Paz Baja Sur California, 'gateway to the sea of Cortez', group fun Baja offers opportunities to explore the wonders of the beautiful Baja California Sur region. Enjoy the opportunity to swim with sea lions, whale sharks and the wide variety of marine life that inhabits the sea. At special times of the year we provide one and two day whale watching adventures. Fun baja also offers a trip to the amazing copper canyon on the mainland side of the sea. Our meticulously maintained fleets of boats and well trained staff have been providing safe and exciting adventures in Baja California Sur since 2000. All of our tour operators and guides are bilingual. Our offices are located in the costa baja resort & marina in La Paz, offering the fastest access to the unique and protected islands in the sea of Cortez. 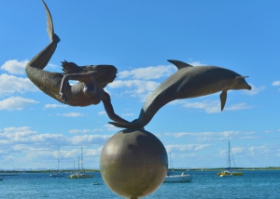 La Paz, capital of the state of Baja California Sur and gateway to the sea of Cortez, is our home and our knowledge of the region is unsurpassed. Our years of experience bring you the best value and safest. Costs per diving day - 2 dives, lunch and drinks approx. 150,00 Dollar per person. Pricing should be requested with group separately. The arrival to La Paz is not that difficult - if you take your time. Other dive operators and hotels can be found in the appendix. Those arriving by plane will initially fly to Mexico City. Here the stress starts with the control of the identity papers. It takes about 2 hours to get to a check-in desk, meanwhile you become acquainted with new friends in the queue, if you stay cool. Hence the flights should be planned that way, that you have for the transfer (from terminal 1 to 2 with the airport train) to La Paz at least 4 hours, so you get the passport and baggage clearances done calmly. It's best not to check the items of luggage through, but to check them in again with the receipt of the new boarding card. Who can take some more time may stay for one night in the city. You will find good hotels near the airport. The participants, with timely registration, will be welcomed in La Paz with the CMAS logo and will be transfered in 20 minutes to the hotel. Much pleasure. 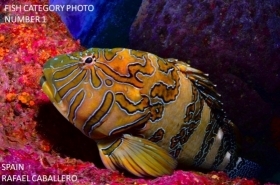 From November 22 to 27, the 16th Underwater Photography World Championship was held, in La Paz, Baja California Sur, Mexico. The event was organized by the Mexican Federation of Underwater Activities, under the supervision of the Sports Committee and the Visual Commission of CMAS.